Recently, there have been an increasing number of clinics offering ‘mini implants’, often at much reduced prices. While the price is indeed tempting, should you be using mini implants? Read on to find out more! Traditional implants measure 4-6mm in diameter and 12-14mm in length. Mini implants fall under the category of Diameter-reduced implants (DRIs). This means that while they may be of the same length as traditional implants, they have smaller diameters. Implants measuring between 2.5mm and 3.3mm in diameter are termed narrow diameter implants. Anything less than 2.5mm in diameter? These are termed mini implants. Studies have been shown that there are proven uses of narrow diameter implants. Namely, they can be used to help denture become more stable. These are known as overdenture abutments. 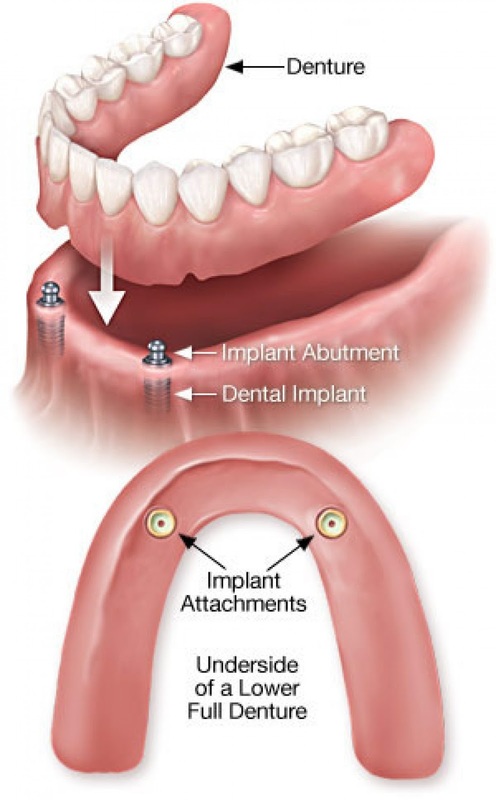 In the picture above, you can see how implants can be used to help dentures become more stable. People who have lost all their teeth usually wear complete or full dentures. These dentures are usually loose because there are no remaining teeth to provide the denture support.In these cases, implants can actually be used to lend the denture support! How so? Implants can act as anchors whereby the denture can latch and hold on to. This allows the denture to be much more stable and better supported. Studies have shown that reduced diameter implants can be used reliably to support these dentures. However, it is not recommended to use these implants to replace single teeth. How about mini implants? Should I use them? According to the guidelines by AMS-MOH, they are not recommended for routine use due to lack of studies done. This is because there is a risk of fracture as they are thinner than conventional implants. That being said, there have been many reports of mini-implants being used successfully. The key is that if they were used correctly under the right circumstances. ‍It is beyond the scope of this article to discuss exact circumstances in which mini implants can be used. Hence, it is extremely important to have an in depth discussion with your dentist if you are planning for mini implants to be done. When correctly indicated, mini implants can be placed in areas where conventional implants would not have been able to be done. For example, in patients with insufficient bone, bone grafting usually needs to be done before conventional implants can be placed in. Because mini implants are smaller, they may be able to fit in without the need for bone grafting, saving the patient time and money. Our lower incisors (bottom lower front teeth) are the smallest teeth in our mouth. Conventional implants are usually too thick to replace these small teeth. In these cases, mini implants may be considered. Can be used in area where little space, where teeth have drifted over time. A quick recap of what constitutes the implant: the fixture, abutment, and the crown. The abutment is what joins the fixture to the crown. A mini implant is often referred to as a ‘one piece implant’. This means the fixture and abutment comes together as one piece. Most conventional implants are referred to as ‘two piece implants’, meaning the fixture and abutment comes separately. This means that there is an additional procedure to attach the abutment to the fixture. Wait! Isn’t that a good thing? This means I can save time by doing one less procedure! Well, yes, it saves time, but one piece implants have been shown to be disadvantageous when it comes to the final product. When the abutment comes separately, it allows for greater flexibility to customise the final crowns. Whereas if the abutment comes attached to fixture, there is only one alignment to place the crown. .At a consensus meeting in 2014, they published some recommended treatment guidelines for implants. Will a longer mini implant compensate for its smaller diameter? Because mini implants are compromised in terms of diameter, it is usually recommended to compensate that by having a longer length. The ITI recommends a minimum length of 10mm for mini implants. With that being said, this does not mean that the longer a mini implant, the stronger it is. Secondly, there are many important structures within our jaws. An overly long mini implant can damage these important structures. One of these structures is called the Inferior Dental Nerve (IDN). It runs along the base at the back of our jaw. The IDN supplies sensation to our chin, lips, and tongue. An injury to the IDN causes numbness over this areas and is a serious issue. When implants are placed at the back of the jaw, we are always meticulous in ensuring that the implant is not long enough to reach the IDN. This is because if the implant is too long, it can injure the nerve and cause permanent numbness. My dentist says that no surgery needed is for mini implant! Really? In conventional implants, a small ‘surgery’ has to be done. This involves making an incision in your gums to expose the underlying bone. The implant is then drilled into the bone. Mini implants technically do not require such ‘surgery’ insofar as raising the gums and exposing the bone.They still require drilling through the gums and into the bone. In fact, this may present as a disadvantage. The benefit of exposing the bone before placing in implants is so that the dentist has a good view and sense of the orientation of the implant. The implant must be house entirely in bone. In many cases, the overlying gums hide the true shape and geometry of the bone lying beneath. By placing in the mini-implant without exposing the bone, there may be misorientation of the final implant. In some severe cases, a part of the implant may have perforated the bone without the dentist knowing! In the long term, this leads to infection, pain, swelling, and eventual failure of the implant. My dentist says I can place multiple mini implants to increase the overall strength! While that may be true in some cases, placing too many mini-implants inevitable leads to problems like difficulty in cleaning. In addition, it is recommended to have a space of at least ___mm between implants. Placing too many mini implants too close together will cause bone loss. In addition, if you have to use multiple mini implants, the overall cost may add up. It may end up not being much cheaper than conventional implants. In that case, why not place in larger, but fewer conventional implants instead? You get to simplify the treatment and may be able to have more predictable results.